Cast Away on the Letter A by Fred, the pseudonym of Frédéric Aristidès, creator of one of the most famous graphic novel series in France (did you know that the French have long been huge graphic novel fans?) 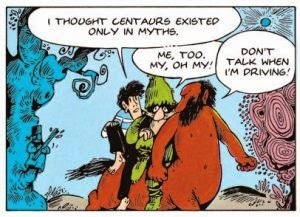 was originally published in 1972. 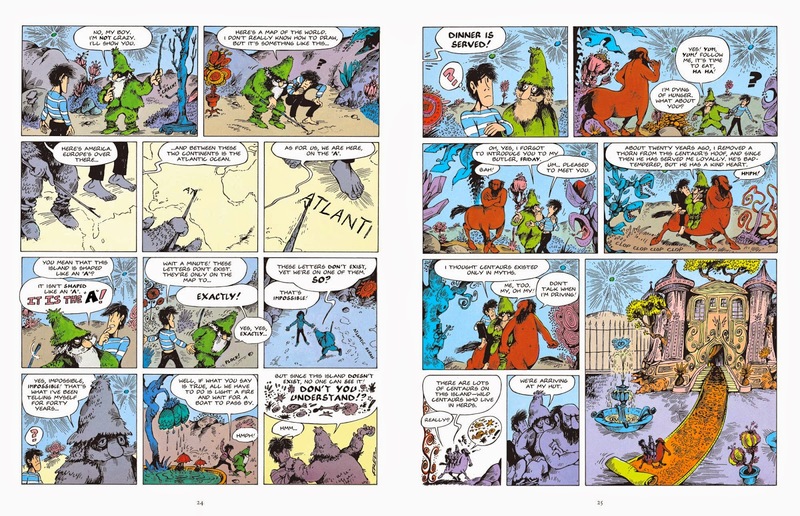 This is the first time it has been translated in English, thanks to the amazing François Mouly and the fantastic people at TOON Books who are dedicated to giving emergent readers quality, high interest books. Last year, TOON Graphics, a line of graphic novels for kids reading at 3rd grade level and above, was launched and Cast Away on the Letter A is one of the featured titles! 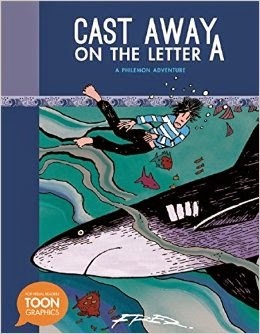 When we meet Philemon on the first pages of Cast Away on the Letter A, we learn that he is an imaginative teenager who lived on a farm in France back in the 1960s along with Anatole, Phil's trusty friend who is also a donkey, and his grouchy father, Hector. 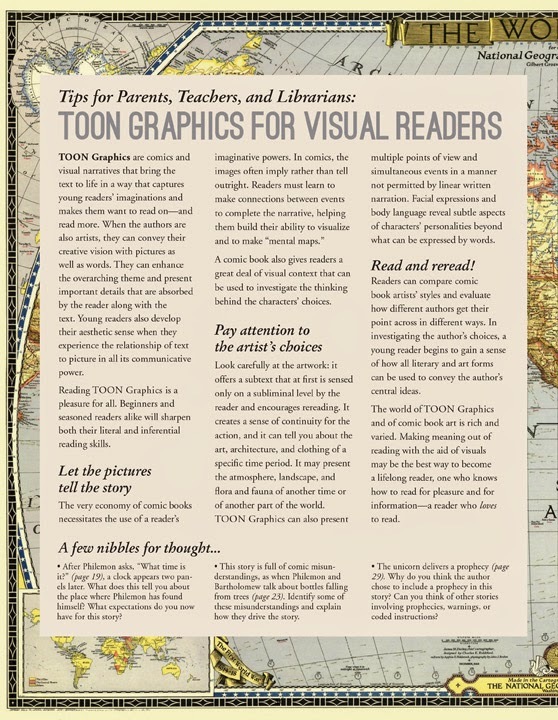 One thing that I LOVE about TOON Books is the love and appreciation that Mouly and her staff have for the graphic novel and how much they want readers to share in this passion. Because Cast Away on the Letter A was written in 1972 it looks different from the graphic novels and illustrations in children's books today and the story moves at a slightly different pace. 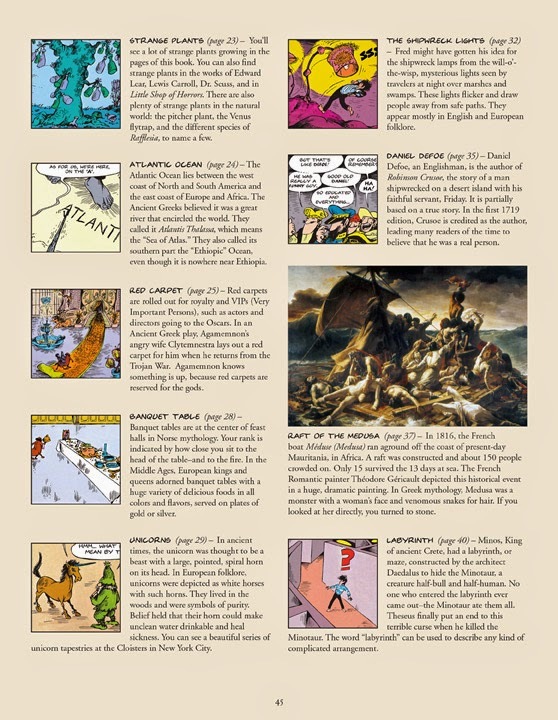 The "Meet Philemon" introduction and the SUPERB "Visual Glossary and Index," along with the tips for parents, teachers and librarians at the end of the book give context for the story and interesting, valuable information and insights that enrich the reader's experience. When the pump on the farm breaks, Hector sends Philemon to the well for water, where he discovers a message in a bottle that reads, "Help! Don't abandon me." Despite Anatole's protests, the goodhearted Philemon decides he has to go down in the well to investigate further. This is when he ends up in another world altogether, a cast away on an island where he meets Bartholomew, the sender of the message in the bottle. Phil discovers that Bartholomew is the well digger of legend from his village who disappeared forty years ago while digging a well. As Philemon tries to acclimate to the strange ways of the island, and Bartholomew, he soon discovers what he is on and where, exactly he is. 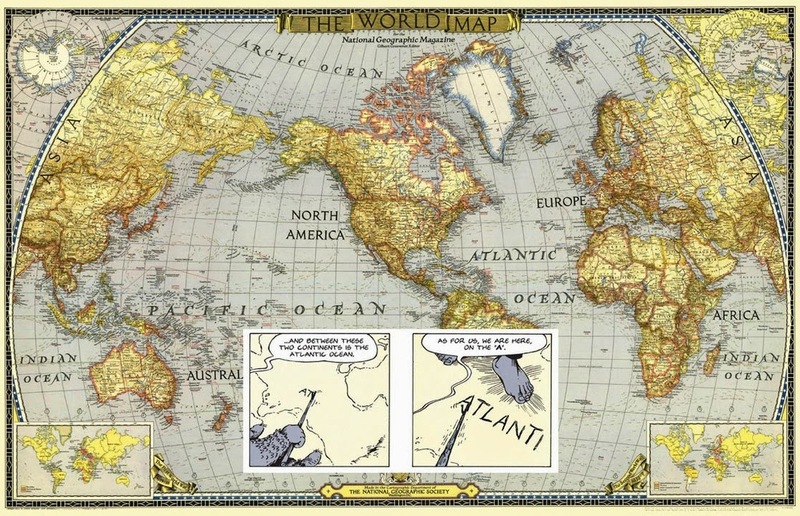 Phil is a cast away on the letter "A" that spells out the word "Atlantic" on the map! Happily, Philemon finds a way home. 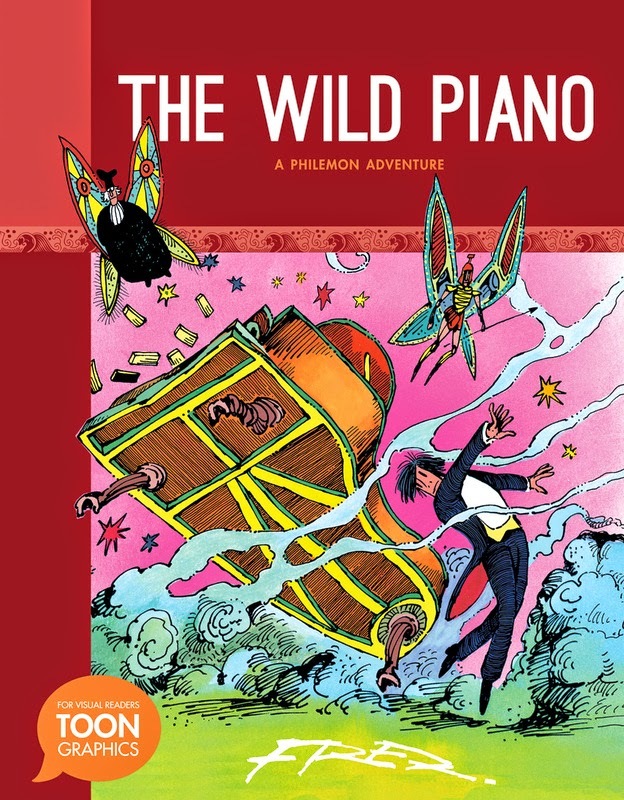 Even more happily, his next adventure, The Wild Piano, will be published next year!